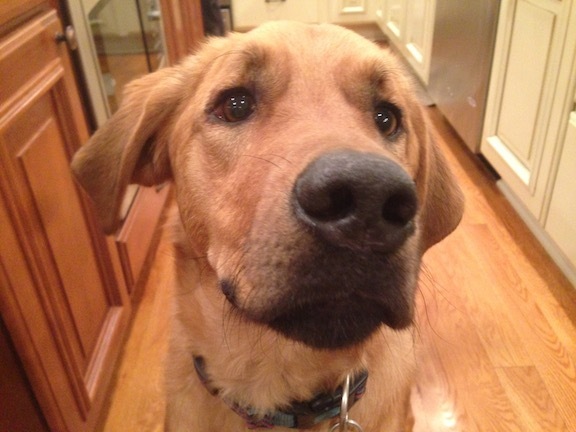 Kolbe is a one-year-old German Shepherd / Golden Retriever / Lab mix. His owners called me to help lower his excitement and get him to listen better. As soon as I saw him I knew that this dog had excess energy; it was practically oozing out of him, His breathing was fast and so were his movements. He showed good curiosity but an almost complete disregard for anyone’s personal space. When I sat down to discuss the situation with the family, Kolbe paced the floor around us frequently stopping to nudge someone to pet him. Any time that he nudged but didn’t get an immediate reaction from the human, he whined in an anxious way. After watching this go on for about five minutes, I pulled out a leash, attached it to his collar then stood on it about two feet from his head. I like to apply this technique whenever a dog is over excited and can’t seem to settle themselves down. A minute after I attached the leash, Kolbe laid down next to me and stopped his whining. I suggested that his family incorporate this same technique any time that Kolbe got over excited in the future. But I also made sure that I pointed out how much exercise he needed and the lack of such exercise was a big part of the reason he was so excited. His family told me that he is usually taken on a 20 minute walk in the AM and then gets play dates with neighborhood dogs at their houses as Kolbe’s yard is not fenced. While playing with dogs is an energy draining activity, it doesn’t do much in terms of growth and personal development. And when it is the dog’s primary energy release, it can inadvertently train the dog to adopt a higher level of energy. Dogs often raise their energy level to match the highest energy in the room. Because Kolbe’s family has a higher level of energy than most, he is already susceptible to over excitement or stimulation. But when its often paired with a dog who is also in an excited state, it essentially gives the dog more practice at being at that energy level. I decided to introduce a leadership exercise that the family and dog can practice that will instill a calmer, more focused energy. The exercise involves the human placing a high value object or treat on the floor, claiming it, then walking away in a controlled way that tells the dog it needs to ignore it. As soon as I stepped forward, Kolbe stopped and looked up at me. I waited to make sure the dog was staying put, then took one deliberate step backwards keeping my hips and shoulders squarely pointed at the dog. Kolbe looked down at the treat, then back up at me. As soon as he looked at my face, I took another deliberate step backwards. Stepping back with good timing is a crucial part of this exercise as it helps you tell the dog that its action was what you wanted. After pausing for a second, I took another step backwards away from the dog. This time, Kolbe looked up at me, looked at the treat, then laid down. As soon as he did, I approached the treat on the floor, stoping about two feet away from it. I turned so that it was on my left side, then knelt down and tapped behind the treat to communicate that Kolbe could have it. I tapped a few times, but Kolbe remained laying on the floor looking up at me. Its pretty common for dogs to do this as the initial part of the exercise tells the dog “leave this treat alone.” So the first few times we following it up by saying the dog it can have it, it can be confusing initially. Although the exercise involved Kolbe mastering multiple cues, I didn’t use any words to communicate what I wanted. Dogs communicate through body language, movement, eye contact and energy. By showing the members of the family how do have this same conversation, I knew I would deepen the leader follower relationship on a very fundamental level. I went through the exercise a few times myself until I knew Kolbe was starting to figure it out. My goal was to get the dog started and let the members of the family observe me and what was possible with their dog. But I stopped before the dog fully figured it out. When a dog figures out this exercise, the excitement and happiness of that realization can be shared with the handler. I wanted Kolbe to have that experience with a member of his family. Initially Kolbe’s owner had a little difficulty completing the exercise. It sounds simple, but there are a few things going on which can be a little overwhelming at first. His reactions to Kolbe’s movement were far too slow. By the time he started reacting, Kolbe was two moves ahead. When you are working with a dog this way, timing is everything. As we practiced, Kolbe’s owner’s timing and movements began to sharpen. Once they did, Kolbe took notice and started to show him more respect by increasing the distance the dog kept from the treat. It took about 8 minutes of persistence, but Kolbe’s owner stuck with it and that investment certainly paid off in respect the dog earned for his master. As we had been going through the exercise I had noticed Kolbe was becoming more relaxed. This is important to point out as Kolbe’s energy early in the session was a stark contrast to his new relaxed state. By the time the dog fully mastered the exercise with his owner, he was by far as calm and centered as at any time in the session. All the members of the family could see and feel the difference in energy. At this point we had been going through the exercise for maybe 15 minutes. While this exercise is not a replacement for the physical exercise and release Kolbe needs, the mental workout it provides will go a long way to enhancing the relationship with the members of the family and the dog. I coached all of Kolbe’s owners through the exercise until the dog was practically doing it on auto pilot. I recommended that everyone in the house practice this exercise multiple times a day with Kolbe and then went over how to make it more challenging to keep Kolbe sharp. I almost hesitate to say it as it seems like I sum up all of my session posts by saying it, but Kolbe was completely calm and relaxed at the end of the session. Kolbe is a smart dog and he wants to please his owners. Now they know how to communicate with him in a way he clearly understands, they can guide and disagree with unwanted actions or behavior before they star. Combine that with regular structured walks and mastery of the leadership exercise and you have the prescription for one balanced, well behaved Kolbe!